Indeed, the President had initially outlined a plan for the space agency in 2010, directing NASA to build a new heavy-lift rocket, designed to carry crew to Mars in the mid-2030s. As such, today’s announcement from Obama wasn’t particularly noteworthy in its content; however, it did serve to reaffirm the President’s vision for the nation’s space program. Interestingly, on a day when both Commercial Crew partners – Boeing and SpaceX – noted that their first crewed missions to the International Space Station (ISS) may be delayed, the President specifically spotlighted the goal of both companies launching astronauts from United States’ soil within the next two years. Not content with solely focusing on space, the President turned his eyes to an issue much closer to home: education. This also is interesting, considering that when he was a candidate for the presidency, Obama had floated the idea of halting NASA’s crewed missions for several years while the space agency’s funds would be used to support his education plans. In concert with the President’s announcement, NASA administrator Charlie Bolden and White House Office of Science and Technology Policy (OSTP) Director Dr. John Holdren released a statement mirroring much of what was in Obama’s piece, albeit with some interesting details, key among which was how the agency sees the evolution of crewed outposts in low-Earth orbit (LEO). With the understanding that NASA has valuable real estate which can be useful to commercial partners, the agency has asked private industry how they may make use of a docking port on the ISS, and it would appear as if there is a ready demand for such access to the orbiting outpost. “The private sector responded enthusiastically, and those responses indicated a strong desire by U.S. companies to attach a commercial module to the ISS that could meet the needs of NASA as well as those of private entrepreneurs,” Bolden wrote. As part of the agency’s assertion that LEO will soon be fertile ground for commercial endeavors, NASA plans to offer the opportunity for companies to test their hardware on the ISS first. Arrayed with that goal, NASA has recently engaged six commercial partners in its Next Space Technologies for Exploration Partnerships (NextSTEP) program to develop deep space habitats. Both the President’s editorial and the statement issued by NASA make clear that the Journey to Mars will be one undertaken through cooperation among the United States, commercial companies, and international partners. While SpaceX CEO Elon Musk presented the NewSpace company’s plan for Mars colonization two weeks prior to Obama’s piece on CNN, it’s unclear if, or how, SpaceX may be involved with that mission. 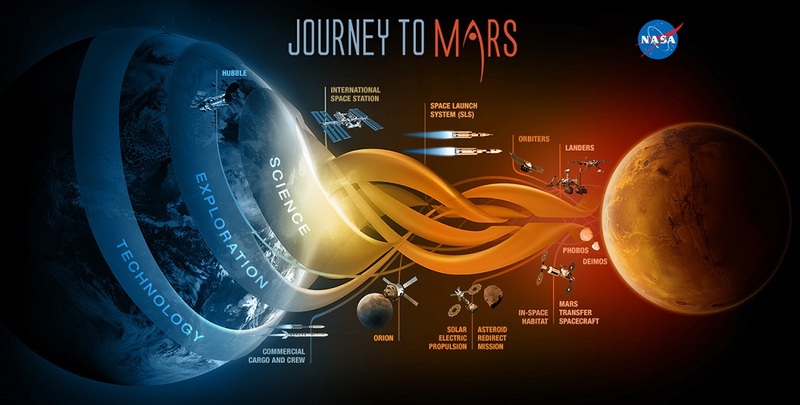 It would seem, though, Obama’s vision for NASA’s Mars efforts align with SpaceX in one key aspect: making humanity a multi-planetary species.